SkinCeuticals cleansers feature gentle cleansing agents combined with purifying ingredients that remove impurities and exfoliate dead skin cells without stripping the skin. Formulated according to professional standards, our cleansers leave skin feeling fresh and clean without increased dryness or oiliness. A facial cleanser is the first step in every cosmeceutical regimen. In addition to removing dirt, oil, dead skin cells, and other unwanted surface debris accumulated throughout the day, a properly formulated facial cleanser effectively primes skin for a daily skincare routine. What is the best facial cleanser? When selecting a facial cleanser, it is best to ensure the formulation is suited to your specific skin needs and that it contains a powerful surfactant system that will clean without stripping skin of natural oils. Formulated to meet the exacting standards of skincare professionals, the SkinCeuticals facial cleanser range is suitable for a variety of skin types including dry, normal, combination, oily, sensitive, and post-procedure skin. Combining high-concentration ingredients with a problem-solution approach, this range effectively cleanses the skin while addressing specific skin concerns including breakouts, excess oil, and dryness. 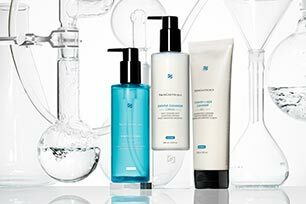 For the most customized recommendation on the best facial cleanser for your skin, please visit a SkinCeuticals skincare professional. What is the best facial cleanser for sensitive skin? Selecting the best facial cleanser for sensitive skin and post-procedure or compromised skin can be challenging, as cleanser formulations often contain certain surfactants that may threaten the integrity of the skin and exacerbate conditions. When shopping for an effective sensitive skin facial cleanser, it is best to use lightweight formulations free of common skin irritants such as alcohol, soaps, synthetic fragrances, and dyes. Look for a facial cleanser formulated with hydrating ingredients such as allantoin, sorbitol, and glycerin to maintain moisture levels and promote a healthy skin barrier. Botanical extracts such as cucumber, chamomile, orchis mascula, and aloe barbadensis leaf extract are also key in soothing sensitive skin. These skin calming agents contain cooling and refreshing properties to naturally calm and comfort skin. Designed specifically for sensitive and post-procedure skin, SkinCeuticals Gentle Clenser is formulated with a potent blend of botanical extracts and hydrating agents to effectively cleanse while soothing and hydrating skin. What is the best facial cleanser for dry skin? Caused by a variety of factors including lipid depletion, dry air, harsh soaps, and in-office procedures, dry skin can often feel tight and uncomfortable. However, many traditional surfactants found in facial cleansers have the potential to strip skin and exacerbate concerns. As a result, it is especially important to look for an alcohol- and soap- free facial cleanser. When selecting the best facial cleanser for dry skin, opt for cream or lotion formulas infused with humectants and hydrating ingredients such as allantoin, glycerin, and sorbitol to help increase water content in skin and promote a healthy skin barrier. Ideal for dry skin, Gentle Cleanser features a creamy, non-foaming formula that removes impurities and long-wear makeup while effectively moisturizing and softening skin. What is the best facial cleanser for oily skin? Oily skin has a unique set of needs, as many traditional oil-fighting ingredients have the potential to dry out skin. When this happens, skin produces excess oil, which may lead to clogged pores and breakouts. As a result, it is best to avoid alcohol-based facial cleansers that can contribute to dryness or irritation. Instead, opt for oil-free gel based cleansers formulated with acids such as glycolic, salicylic, and sulfonic acid to deliver targeted exfoliation. Promoting cell turnover will help prevent clogged pores and blemishes from forming. The best facial cleanser for oily skin will also contain natural humectants such as glycerin to ensure skin maintains adequate hydration levels to prevent skin from producing excess oil. Formulated for oily, combination, and aging skin, Blemish + Age Cleanser combines a blend of exfoliating and hydrating ingredients to decongest pores and remove excess sebum without stripping the skin. How do you use a facial cleanser? A properly formulated facial cleanser is the base to every skincare regimen. Depending on your skin type and lifestyle, cleansers can be used once or twice daily. If cleansing once a day, it is best to do so in the evening to help remove any dirt, debris, or oil accumulated throughout the day. For the most effective cleanse, gently massage a dime-sized amount, or one pump worth of product, onto a wet face and neck using a light circular motion. Rinse thoroughly with warm water and use a towel to pat dry. When drying your skin, a light patting motion is recommended to avoid any potential irritation that may result from excessive rubbing. Facial cleansers are best used in conjunction with toners. After cleansing and drying the skin, apply a small amount of facial toner to help balance skin’s pH levels. The additional benefit of applying a toner is that these solutions remain on the surface of skin, allowing the exfoliating, decongesting, and soothing ingredients to effectively prime skin for the remainder of your regimen.